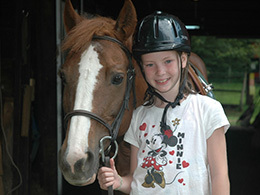 Our two spacious stables can accommodate up to 28 horses and ponies that all live in box stalls. 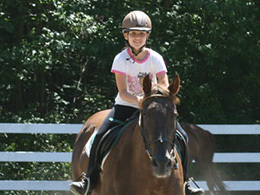 Nashoba Day takes pride in our prized horses and ponies who return to camp each summer. They are known for their dependability, suitability and calm manners. 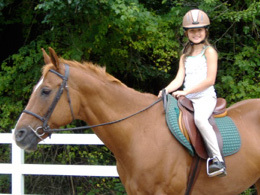 The riding program focuses on hunt seat equitation and the balance seat style of English riding. 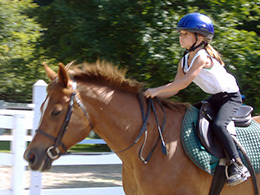 Riders may chose to ride either one or two hours a day and have a third hour at the stable for a hands-on horsemanship lecture. Our talented equestrian staff can teach beginners learning to steer through advanced riders that compete at the jumping level. All lessons are scheduled according to ability. 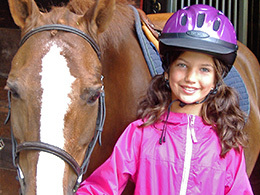 Nashoba’s hands-on stable management program allows riders to learn all about horses, including: grooming, feeding, conditioning, saddling, bridling, ailments/illnesses, conformation, first aid and much more. 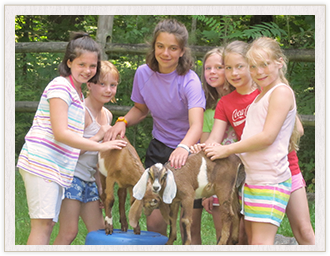 Classes are small, personalized and interactive. 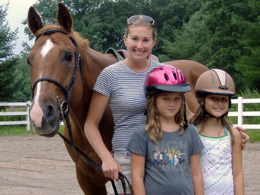 Camp Nashoba Day is thrilled to announce Tricia O’Connor, Grand Prix rider will be conducting training clinics for enrolled campers at Nashoba Day this summer. Tricia is an accomplished rider and coach who has competed in Grand Prix classics in Germany, the East Coast and Mid West in the United States. 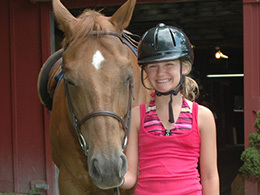 A two-time Day America Young Rider and Olympic Festival competitor, Tricia will bring insights to Nashoba Day’s developing riders. No stranger to the winner’s circle, Tricia has successfully coached junior and amateur riders in the Equitation, Hunter and Jumper finals. A native of Massachusetts, Tricia winters and coaches in Ocala, Florida. This Spring Tricia is training Eventing and Hunter prospects while coaching her students in Jackson Hole, Wyoming.